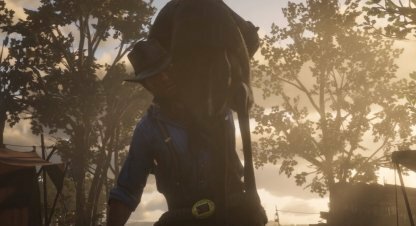 Learn all about the different Talismans and Trinkets in Red Dead Redemption 2. This guide will tell you how to get the different talismans and trinkets, their effects, and the materials needed to craft them! 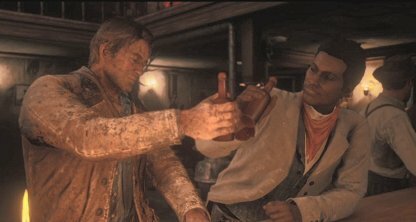 1x Legendary Alligator Tooth Permanently decreases the speed that the Dead Eye core drains by 10%. 1x Legendary Bear Claw Permanently decreases the speed that the health core drains by 10%. 1x Legendary Boar Tusk Permanently decreases speed that the horse health and stamina cores drain by 10%. 1x Legendary Bison Horn Permanently decreases the speed that the stamina core drains by 10%. Raven Claw Talisman 1x Old hrass Compass Permanently slows degradation for all weapons by 20%. Beaver Tooth Trinket 1x Legendary Beaver Tooth Permanently slows degradation for all weapons by 10%. Buck Antler Trinket 1x Legendary Buck Antler Player receives higher quality skinned animal parts. Cougar Fang Trinket 1x Legendary Cougar Fang Permanently increases player's stamina experience bonus by 10%. Coyote Fang Trinket 1x Legendary Coyote Fang Permanently increases player's Dead Eye experience bonus by 10%. Elk Antler Trinket 1x Legendary Elk Antler Permanently increases the value of player's looted money by 10%. Fox Claw Trinket 1x Legendary Fox Claw Permanently increases the time that Eagle Eye can stay active by 5 seconds. Lion's Paw Trinket 1x Lion's Paw Permanently increases the player's stamina experience bonus by 10%. Moose Antler Trinket 1x Legendary Moose Antler Permanently increases the player's health experience bonus by 10%. Panther's Eye Trinket 1x Legendary Panther Eye Permanently decreases the speed that the Dead Eye Bar drains by 10% for 3 seconds. Pronghorn Horn Trinket 1x Legendary Pronghorn Horn Stops animals on horseback from spoiling. Ram Horn Trinket 1x Legendary Ram Horn Picking Creeping Thyme, Oregano, and Wild Mint yields 2x more herbs. Wolf Heart Trinket 1x Legendary Wolf Heart Player can consume 2x more alcohol before feeling the negative effects of being drunk. Tatanka Bison Horn Trinket 1x Legendary Tatanka Bison Horn Permanently decreases the amount of melee damage received by 10%. 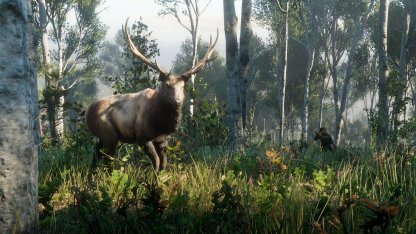 Getting the Buck Antler Trinket early on in the game will help you a lot when hunting. Getting higher quality animal parts will aid you in crafting furnitures and clothes. 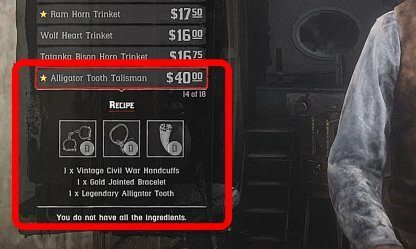 Here is how to get your hands on some Talismans and Trinkets in Red Dead Redemption 2! Also included are some things to remember when you are trying to get some Talismans and Trinkets. You will first need to locate a fence within the game. Fences buy stolen items off of you and also craft Talismans and Trinkets as a service. 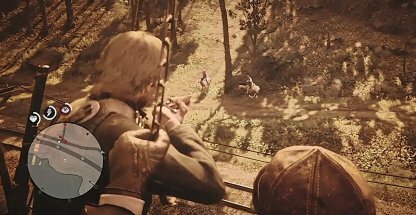 Fences will only be unlocked after completing the Chapter 2 Mission: The Spines of America. Other than money, you will be needing some materials to be able to craft at the fence. These materials are essential to create the items that will give you perks and other bonuses. Most of the materials you will be needing comes from Legendary Animals. 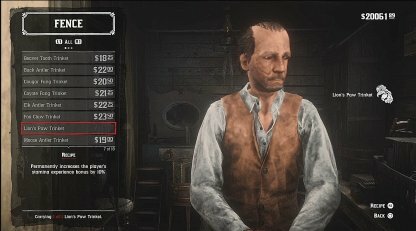 These materials can be acquired through hunting the Legendary Animals throughout the map of RDR2. What Do Talismans And Trinkets Do? Here are some of the perks and bonuses that Talismans and Trinkets will grant you once you have them. Talismans and Trinkets will give you an edge in combat. They can slow down how fast your weapon degrades, prolong Dead Eye, and even increase the amount of experience you gain for the Health, Stamina, and Dead Eye! Other Talismans and Trinkets will help you greatly when hunting other animals in the wild. They can prolong the length of your Eagle Eye ability, give you better quality skinned animal parts, even stop animals on horseback from spoiling! Talismans and Trinkets also give you other bonuses such as yielding more herbs when gathering, loot more money, and drink more alcohol! 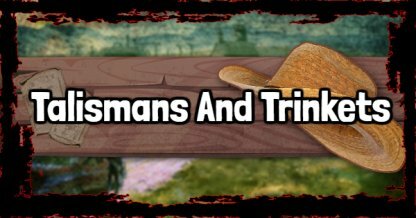 Talismans and Trinkets both offer perks and bonuses that will help you out in the game, but the main difference is that Talismans are harder to make than Trinkets. This is because they also require other rare items you get from around the map.